The first inhabitants that settled in Olymbos, according to the tradition, were seventy (70) families who came from the ancient city of Vrykous, today called Vroukounda. 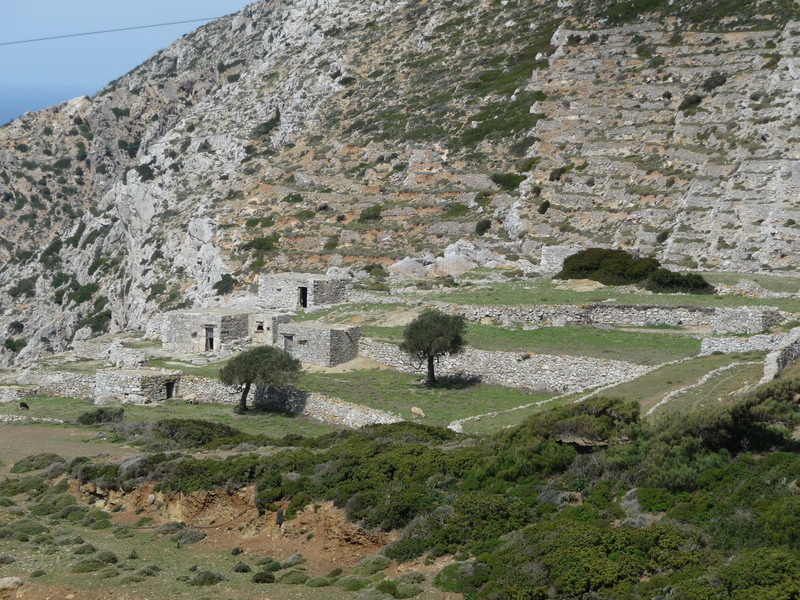 Vrykounda was one the four ancient cities of Karpathos, the other three were Palatia, Posideon, and Arkesia. 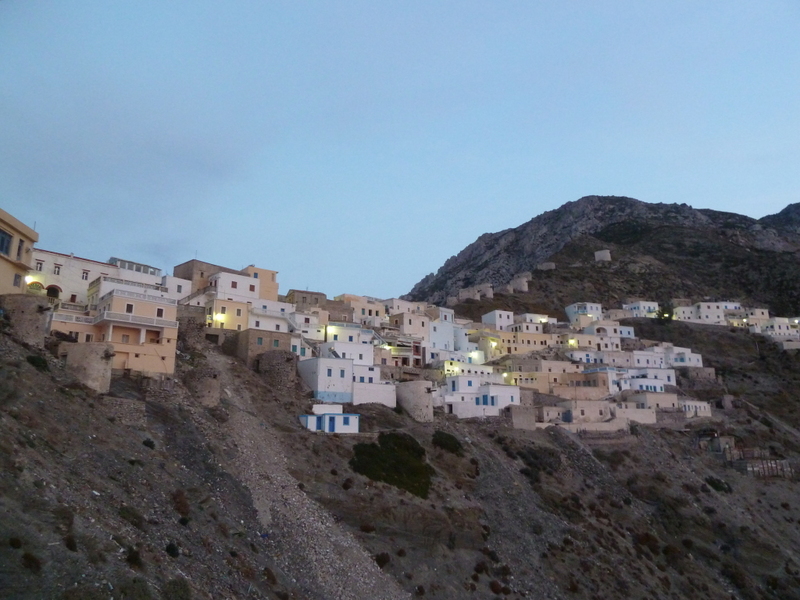 This is why Karpathos was also called “Tetrapolis”, which means “with (of) four cities”. It can be supported that this move took place somewhere around the 6th century A.D., the period of the Arabic raids and the Iconoclastic Period. There are still two churches that stand as evidence of 6th-7th century architecture, Agios Onoufrios and Katholiki, and frescoes in the west dome of the central church of Olymbos, Virgin Mary’s Cathedral. Also, ruins of Christian Temples and churches have been found in the ancient cities of Vrykounda and Tristomo in the nortern tip of the island of Karpathos, and Palatia on the Island of Saria. This shows us that the inhabitants were baptized and already living as Christians. Why did the move occur? One possible reason experts say could be a great earthquake that scared the inhabitants away from the sea. The new settlement was on the top of a mountain which in turn is connected to an even higher mountain, Mt. Prof. Elias. This setting is an even higher threat from earthquakes therefore it should not be a reason for a move away from the shore. The most logical reason of this move then can be attributed to the looting of the island in 647 by Moavias, the Governor of Syria, the raids of the Saracens and the Arabic raids. Those raiders and pirates showed a very aggressive and destructive behavior against any object that was related to Christianity. In 824 A.D., the Saracenes captured the island of Crete and it is very logical that they reached there by using as a bridges the islands of Rhodes, Karpathos, and Kassos, and as such, they progressed from the east to the west. Those raids must have forced the inhabitants of the coastal ancient cities of Vrykous, Palatia, and Tristomo to move away from the coast and seek a refuge that would protect them form the dangers of an invasion by Arab and other pirates. Some Byzantine era monuments were found in the city of Palatia indicate that the city was inhabited even after the raids. The belief is that Arabs inhabited the city and used it as a base to launch their attacks to ships and other cities. The site where the aborogininals settled, Olymbos, is excellent in terms of protection from an invasion. A castle was built around the higher part of the village to protect the inhabitants. A neighborhood called “Mesa Kastro” or “Inside (the) Castle” indicates the location of the castle.The “Oxo Kamara” district or “Outer Gate” also indicates traces of a castle on the west part of the village. Part of another castle gate can be seen today in the center square of the village, Plati. Besides the castle, also the altitude of the village made it hard-to-reach, and also allowed the inhabitants to be able to survey the seas and land for possible invaders. For that purpose, guards were placed around the village in strategic points to monitor the area. In 961, Nikiforos Fokas, Emperor of Byzantium, forced the Arabs out of the islands of the region, including Karpathos. The islands of Crete, Karpathos, and Kassos formed a unit (or county) called the “Thema of Crete”, which was headed by a Byzantine general. When the Franks conquered the Byzantine Empire in 1204, the island was successively governed by the Cretan nobleman Leontas Gavals, the Genoan Moresco family, and the Cretan-Venetian Kornaros family until 1537. In 1537, the Turkish navy under the command of Hairedin Barbarossa overthrew the Frank rule. During the Greek revolution of 1821, Karpathos revolted and overthrew the Turkish rulers but it was given back to Turkey under the provisions of the London Protocol, signed in 1830. The Italians took over from the Turks in 1912. According to the provisions of the London Protocol, special tax and administrative privileges were granted to the inhabitants. This allowed them to establish a democratic local government and enjoy a decent standard of living. During the Turkish and Italian rule, Olymbos was governed by a council that was elected by adult men with administrative, tax, educational, and judicial powers. These local people help manage the needs and balance any conflicting interests of the inhabitants. The Dodecanese Islands finally joined Mother Hellas (Greece) in 1948.